SMALL SIGNAL ANALYSIS OF INTEGRATED POWER SYSTEMS is an essential tool to discover possible low frequency oscillations which if undamped may lead to major power failures. This book covers various aspects of this phenomenon from modeling to techniques to control them. The book covers low frequency in the 1-3 Hz range as well as sub synchronous oscillations in the 10-50Hz range. Damping techniques for both types of oscillations are discussed as well as design of Power System stabilizers. Modeling and design of FACTS devices in included. Selective computation of Eigenvalue(s) in a large system is discussed. 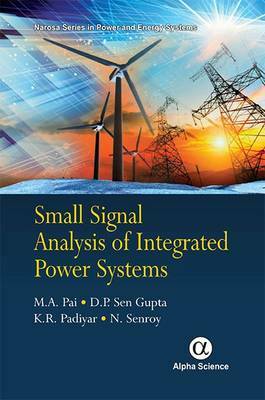 Wind power systems and its integration into the existing grid is discussed along with small signal analysis.